This is one of the more recent additions to the Diamine line up. It’s also one that was proved to be quite popular. Red Dragon is a dark red color, but it’s not at all brown. It’s actual very similar to another recent Diamine release–Diamine Oxblood–, but Red Dragon is lighter and redder. 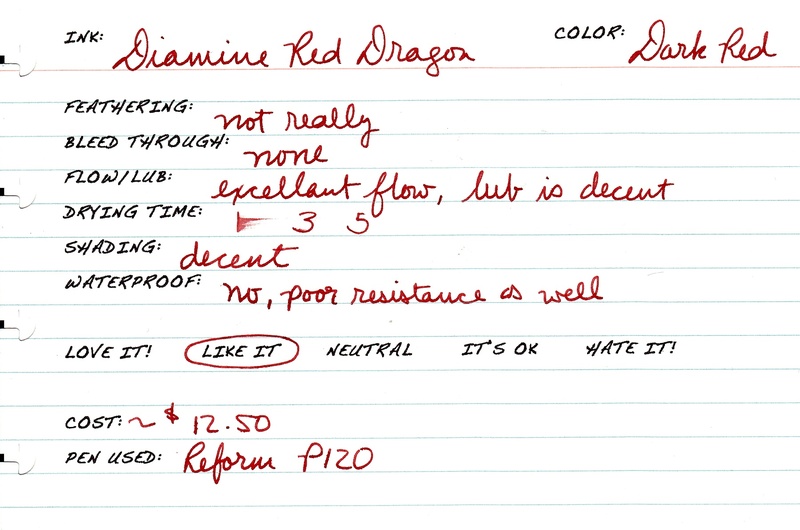 Red Dragon also seems rather similar to Diamine Monaco Red, but it does not appear as brick red / red-brown. All in all, I quite like this red. It’s vibrant, but not cloyingly so. It’s pretty well-behaved. This would make a great red for editing or for use in the workplace. I definitely recommend it. No feathering except for poorer quality papers, but even then it isn’t significant. Excellent flow and decent lubrication. There is some shading, but it isn’t extraordinary. This bottle of ink was sent to me for review by Diamine. I’m not otherwise affiliated with them. What a great colour. I have been looking for a red and I think this will get on the short list.